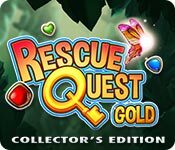 Rescue Quest Gold Collector's Edition is rated 3.1 out of 5 by 14. Rated 5 out of 5 by anng5766 from Love it! I'm surprised at the bad reviews for this game. The instructions could be better but once I figured out that there are a limited number of moves I found it challenging a very entertaining. On many of the levels you cannot see the whole board at once but if you use the scroll wheel on your mouse you can shrink the board down so you can see the whole thing to figure out which way you need to go and there are tons of levels. There are awesome power-ups and they can really help you get through some of the more challenging levels. The graphics are absolutely gorgeous. I've played this game for hours; all the way through once and started over again. I rarely play a game more than once but this one is so enjoyable and challenging that it's like playing it again for the first time. I would definitely recommend this game! Rated 5 out of 5 by catladyx10 from Entertaining! I played the trial version and immediately fell in love. 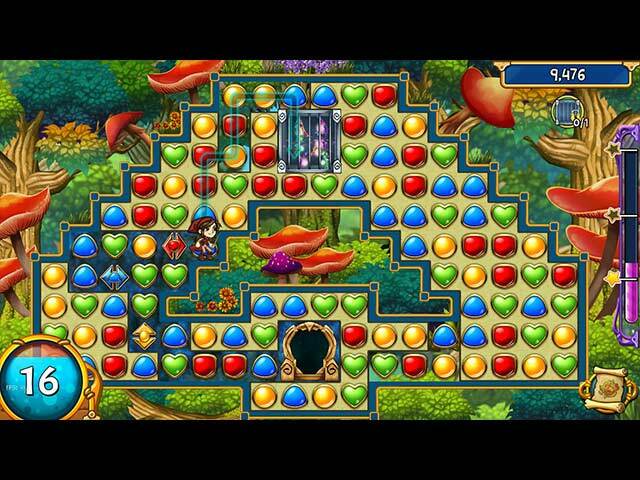 This is an addictive game requiring some strategy to arrive at your goal. I am purchasing the full game now while there is a sale, although it is well worth the regular price. I really enjoy playing this game. Rated 5 out of 5 by blipi69 from One of the best Match3-Games I ever played I really enjoyed this game - it istn´t the same old gameplay - you have to free ways to move your character to places - a little bit like the good old game "Finding Doggy" only in my eyes much better. The graphics are absolutely gorgeous and the Music nice and not annoying. 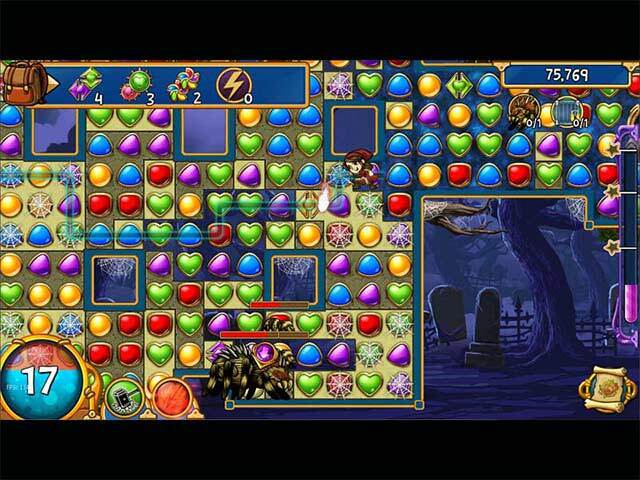 The levels have at the beginning easy then moderate and later hard difficulty. I can really recommend thsi game! Rated 4 out of 5 by catlynn54 from Take time to plan moves I really liked this game. There is no time limit, but a number of moves limit. So you must plan your moves to be most efficient in getting the little guy to the spritelings. It is not fast-paced for that reason. I played through level 9 before deciding to buy. There is a bit of a learning curve with it. Rated 4 out of 5 by LanaPook from Challenging and fun This is not you classic match 3 game. You have to make the way for your character to unlock the cages. You fight monsters and forge complicated pathways. This game could use a little more information. Sometimes it is hard to know if you have finished a level until you use the last move. Then the little character will run around to collect keys and open the cages. IF you like it there are 260 levels. Play on! Rated 4 out of 5 by brimaz from I LIKE IT! I didn't expect to like this game, but after a few levels I was convinced it's not a bad game at all. Once you get used to the rather odd way of playing, it becomes fun and challenging. It's a bit annoying to have to move the board to be able to play all the tiles, bit that's just part of the game. While I'm not a lover of limited move games, I found myself enjoying having to replay a level to be able to finish it. Overall it's fun and challenging, but I certainly wouldn't pay for a collectors edition - I'll wait for the standard version to be released. 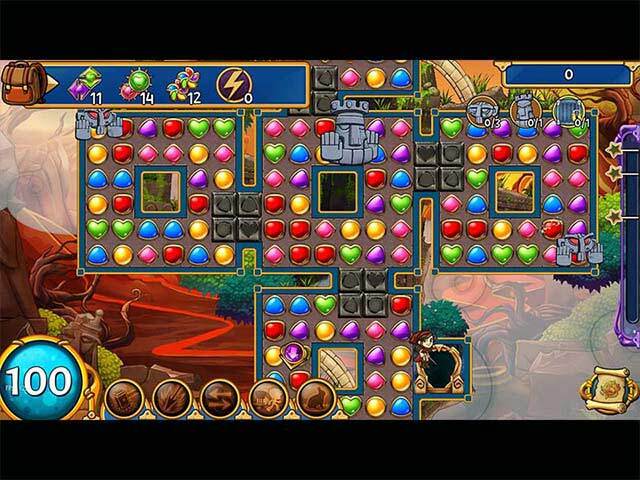 Rated 3 out of 5 by pennmom36 from THE FEATURES ARE TOO ANNOYING TO ENJOY THE MATCH 3 GAME I love a good Match 3 game, my favorites are the Cradle of Rome series, Lauraville, and Jewel Match Royale. I also love it when the devs think outside the box to give us new features, some are fantastic features, and others just don't enhance the game, they make it less enjoyable. Rescue Quest Gold has one of those features that are more aggravating than enhancing. You can drag the board around, and zoom in and out, which in itself isn't all that bad, but for whatever reason, the board would zoom in and out all by itself at random times, and I was constantly having to readjust the boards position. Another feature that really annoyed my, was having to hear "move here" every time I wanted my Avatar to move in a different direction. This is a Swap type Match 3 game, with Limited Moves and Time restrictions. Each level has the same goal, to make matches strategically, so that a path is cleared for the Avatar to reach and release the Spritelings. If the chosen path isn't necessarily the best route, you have to double-click tokens to make the avatar blaze a new path, and as I said, it can get annoying. Matches of 4 or more tokens will earn you a Slash Token on the board to slash several tokens, matches of 5 or more tokens in an L or T formation will earn a Bomb token, and a match 5 in a row earns a Wild Token that removes several same colored tokens. As you progress you will unlock powerups that can destroy tiles in a column or row. Darker tiles require multiple matches to destroy them. I'm sure this colorful game will be a hit for many gamers, but for me, it was boring and had too many annoying features that outweighed the entertaining features. I also don't see the need to pay twice as much money for a Match 3 game just to get 12 Wallpapers, 10 Concept Art pictures, 8 Music Soundtracks, 56 Achievements and 10 Avatar pictures. Rated 2 out of 5 by Deverat from Resue Quest i played it to 8 levels ,you have to go fast to rescue fairies held in cages,you only have so many moves or have to try again .after 8 levels i found it boring,same thing over and over again ,story none existing,there was nothing really to collect build or accomplish,except get as fast as you can to free the prisoners.Maby fun a kid,but i think it wares off real quick ,really simple game . Rated 2 out of 5 by Trash89 from Cute But Annoying By Level 9 of the 1 hour demo I had, had enough. The constant instructions could not be turned off and the cute but annoying music and verbal encoragement were making me grit my teeth in frustration. Even turning the music and sounds could not make a diffrence. The cost of two credits was to high. I would give this cute but very annoying game a big miss.